posters2, originally uploaded by salam pax. This is the unedited transcript of radio ‘postcard’ which appeared on BBC Worldservice programme Outlook. 26.01.08. Last night me, my father, my uncle and my cousin were all sitting around the dinning table looking at a three sheet pamphlet titled ‘How to Vote in the Provincial Council Elections’ …and we were finding it all too complicated. Politics in Iraq seems to be following the rain patterns here. It doesn’t rain in Iraq very often.. actually it rarely ever does. It’s dry and hot in summer, dry and cold in winter.. but when it rains it pours. So after decades of living in a dictatorship and never casting a single vote… here we are getting ready to cast our votes for the fourth time in four years. We queued up in front of voting centres twice for legislative elections and once for a referendum on our constitution. This time we are voting for our Provincial Councils. There are 18 provinces in Iraq and each will have it’s own council. 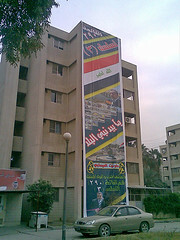 The biggest is in Baghdad with 57 council members. The number of candidates campaigning for these seats is astounding … there are 2371 candidates just for Baghdad. The total number of candidates all over Iraq is an astonishing 14,400. And the noise these thousands of candidates are creating is enough to make you withhold your vote just as a protest. 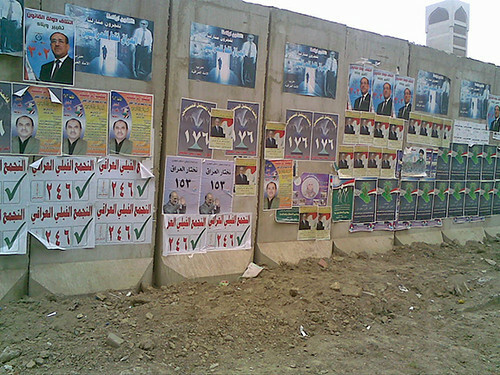 Campaign posters cover every square centimetre available and when the walls ran out they hung then down every tall building they can get access to. If they are not trying to overwhelm you with the size of their posters they will be by your grocery store pushing little cards with the photo of the candidate and his number in your hands while you’re trying to keep hold of your bags. “Your life is valuable” calls out one very yellow poster.. beside it three men I’ve never seen before pose smiling on another poster announcing that “Change is in your hands”… men and women smile, frown, point and hold pens – there is a lot of pen holding on these posters – and promise me everything… from change, to reconstruction and jobs …but all I can think is ‘who are these people?’ and I can assure you the majority of the fifteen million Iraqis who from the electorate are thinking the same. The last two times we had legislative elections it was easier the same parties and individuals were up for election in the whole country. This time it’s different in each province. And trying to find what each of the 14 thousand candidates stands for isn’t just difficult but impossible. Some candidates with deep pockets are plastering their faces and numbers everywhere. The boldest take on this I’ve seen is by the current Baghdad mayor whose five story high campaign poster smacks me in the face every time I step out of the house. Other candidates are tiring our ears with their broadcast messages. Our current prime minister has practically commandeered the official tv station and broadcasts the rallies he does in the name of his party almost on a daily basis… smells to much of the old times for me. And the closer we get to the election date the uglier it gets. A well known Sunni owned television station started broadcasting a message almost calling one of the Shia candidates a tool of the Iranian government. One the other hand Shia campaigns call on voters not to give their votes to those who killed and terrorised them, a thinly veiled attack on sunni candidates. Oh it’s getting ugly, Messers ‘Fair’ and ‘Civil’ have certainly left the building. And none of this is helping us… bent over three large sheets full of names and guidelines to figure out who to vote for. Although one of my younger cousins seems to have figured it out. He walked in and announced the name of the candidate he’s voting for last night. It’s his first time to vote as he wasn’t old enough the last three elections. When we asked him why he chose this specific person who none of us have heard of, all he said was ‘the posters look cool’. My uncle sighed and went back to studying the list of 2371 names. This entry was posted on January 29, 2009 at 1:05 pm and is filed under Uncategorized. You can follow any responses to this entry through the RSS 2.0 feed. You can leave a response, or trackback from your own site.